Sheer cliff walls rising thousands of feet above your head, shimmering colors in the deep canyons, a quiet sense of peace from Nature's magnificence -- all this awaits you at Zion. Pictures don't do it justice, clearly words don't do it justice. It has to be seen to be believed. Talk to anyone who's been there, and you'll hear just how impressive a gem Zion National Park is. Zion is at its heart a canyon, carved by the Virgin River. This small river began its work over 13 million years ago when the area was uplifted, and continues carving today. Cottonwood, willow and ash trees shade the canyon bottom, providing shade for ringtail cats, bobcats, foxes, rock squirrels and rabbits, along with hiking humans in need of a rest from the summer heat. Ancestral Puebloans and Paiute Indians lived in Zion, perhaps year-round. Mormon settlers lived here in the spring, summer and fall, experiencing Nature's turbulence and beauty. The area was described to disbelieving outsiders in the late 1800's, and by 1909 the Park was added to the National Park Service. 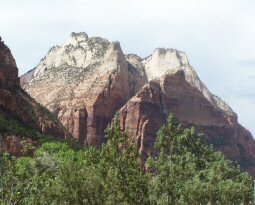 The Zion-Mt. Carmel highway, considered a marvel of engineering in its time, was completed in 1930. 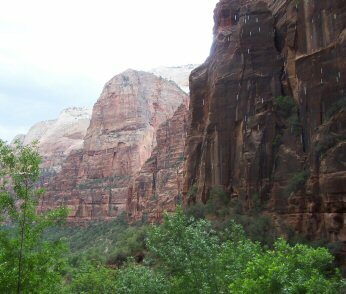 Built across rough terrain, it connects lower Zion Canyon with the east and boasts two narrow tunnels, one of which is an impressive 1.1 miles long. Bet the kids can't hold their breath through that! Zion is cool, Zion is impressive, Zion is awe-inspiring. You've got to go there. The cliffs are huge and rise straight up into the air, massive and spectacular, and you're right there! There's a tram service in the summer months, with buses running every 5-7 minutes throughout most of the day, and they let passengers off at all the major viewpoints. Prepare yourself for ooh's and ahh's, because you'll be hearing plenty of them. The colors are wonderful, the Virgin River waters plentiful shade trees, and even in the middle of the summer, which is prime visiting time, it doesn't feel crowded. The visitors center is impressive, perhaps second in the Park System only to the Grand Canyon. There are interpretive exhibits outside and inside, and the personnel are helpful if a bit harried. 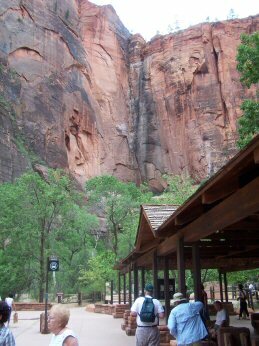 Cars are not allowed on the Zion Canyon Scenic Drive from April through October, because of congestion, but the bus system is a good system. The town of Springdale offers all the services you'll need, right on Zion's border. The buses even come into Springdale, and you can pick them up from your motel front door and go right into the park! 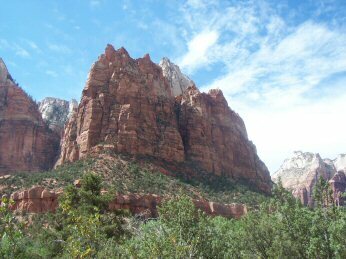 Kolob Canyons is part of Zion, but is not accessible by car from Zion Canyon. 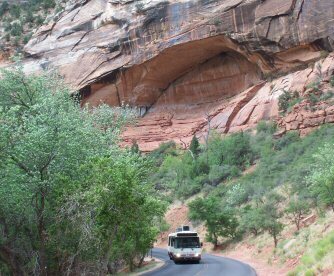 Instead, you must exit the park, get back onto I-15 for 20 miles, and take Exit 40 off to the Kolob Canyons Visitor Center. There's a nine-mile scenic drive that is very impressive. 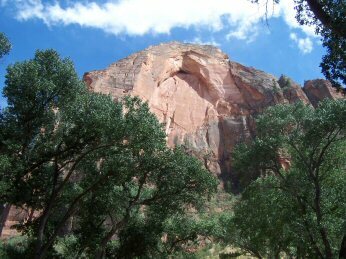 A long (14 mile) hike on foot will bring you close to Kolob Arch, perhaps the world's largest freestanding arch. Zion is fantastic. Have I mentioned that already? I love nature-stuff, and Zion offers all I could want. I understand the Narrows trail is wonderful, thought I didn't have time to explore it myself. We did climb the Weeping Rock trail, only 0.5 mile round trip, and I recommend it heartily. While the rest of the canyon can be dry and hot (this was in June), the water seeping from the canyon walls was cool as it fell upon our faces. It also fed the hanging gardens of wildflowers that decorate the canyon walls. I was a little bummed that I couldn't drive through the canyon, but the kids thought riding the buses was a kind of adventure all by itself, so it worked out just fine. The 1.1 mile tunnel from Mt. Carmel junction west to Zion was also cool -- built in 1930, it's so narrow that big RV's and trucks towing trailers require a special pass to go through. Basically, traffic is halted in one direction while the RV goes the other way. There are two turns inside the mountain that could problems if the RV should meet a car coming the other way. There are five or so "windows" blasted out of the north wall that give fleeting glimpses of the Park as you drive. No, there's no place to stop and park in the tunnel, sorry. For the kids, a Junior Ranger program is available. I recommend this as well, especially for those little crankensteins whose idea of a fun time does not include oohing and ahhing over magnificent cliff formations. "Dad! It's a rock!" When they complete the program, they get a badge and a photo op with a NPS Ranger. Cool! From Las Vegas or St. George, take I-15 north to exit 16. Go east on Highway 9 for nine miles to Hurricane, then go north for a couple of miles to La Verkin. Turn east again on Highway 9 and follow the signs (about 20 miles) to Springdale and the Park entrance. From Salt Lake City, go south on I-15 to exit 27. Take Highway 17 south to La Verkin, then go east on Highway 9 for about 20 miles to the Park entrance. From Kanab, Utah, go north on Highway 89 for 17 miles to Mt. Carmel Junction. Take Highway 9 west for about 22 miles, through a couple of tunnels, to arrive at the visitors center. Cedar Breaks National Monument, 30 miles to the north; Bryce Canyon National Park, 50 miles to the northeast; Grand Staircase-Escalante National Monument, 40 miles to the east; Glen Canyon National Recreation Area, 80 miles to the east; Vermilion Cliffs National Monument, 60 miles southeast; Coral Pink Sand Dunes State Park, 25 miles to the southeast; Pipe Spring National Monument, 30 miles to the south; north rim of Grand Canyon National Park, 70 miles to the south; Grand Canyon-Parashant National Monument, 70 miles southwest; Lake Mead National Recreation Area, 100 miles to the west.